Union public service Commission conducted national level written examination 3 February 2019 at various examinations for the recruitment of combined defense service 2019. CDS I examination was held for tilling posts of officer in Indian army. UPSC every year conduct this examination twice in a year. CDS I Examination conducted in the month of January and usually CDS II examination held in the month of August. Combined Defense service written test was held on 3 February 2019. Questions CDS 1 bharti pariksha 2019 was difficulty in comparison to previous years. Many of our friends also appeared in this examination they share their views regarding how their question paper was. Questions were not so easy for cracking it rapidly. Questions of math were difficult and time consuming. Difficulty level of mathematics questions was Moderate to difficult level. Maximum no of aspirants faced problem in math section. Questions of English were easy. Maximum no of questions of English paper was asked from Grammar. And question of general Study was also high quality and candidates also face problem in this section. Maximum no of General knowledge questions was asked from history and geography subject. Indian naval Academy INA, and air force academy AFA. 1st paper was related to English subject, 2nd paper was related to general knowledge and 3 paper was related to Elementary mathematics. Each paper will carry total 100 marks. all those candidates who want to admission OTA officer training academy they have to clear only English and GK paper’s total 2 hours had given for each paper. After qualifying in the written examination of CDS 1 2019, qualified candidates will be called for interview test which will be held at SSC service selection centers. All questions of CDS 1 were objective type of the nature. Question paper CDS 1 was not difficult of this year. Difficulty level of elementary mathematics paper was matriculation level. and difficulty level of other paper was Graduation level. We analyzed the questions of CDS I on the basis of participates Feed back. We got a few conclusion about what will be expected cutoff marks for CDS 1 2019. we brought previous year actual cutoff marks for selecting in IMA, INA, AFA, and OTA . Combined Defense Services Examination (I), 2013 Publication of cut off marks * Subject to having secured 15 % marks in each subject. Recently Upjob.in held online poll regarding what will be expected cutoff marks for UPSC CDS 1 examination 2019. More then 4000 candidate share their view and feedback regarding what will be expected cutoff marks. 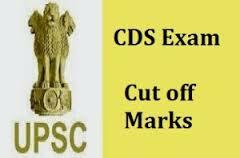 On the basis of their feed back and responses we got few conclusion regarding what will be expected cutoff marks for UPSC CDS Examination. Its not official Cutoff data and its published here just for instant use only on the basis of provisional answer key published different coaching institutes. Official cutoff data will be also update here in the months of June when results will be declared of CDS 1 2019. You can subscribe your emails for receiving all updates of CDS in your emails ID.